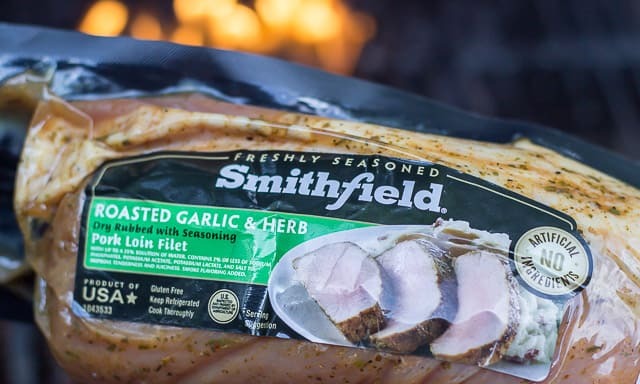 Smithfield Roasted Garlic & Herb Marinated Fresh Pork Loin Filet makes your summer get-togethers easier! After we’d carved the pork loin, we drizzled it with some of the juices. Our Memorial Day weekend plans are typically pretty low key: it’s often just the fam, hanging out at home, grilling and chilling. This weekend our plans changed, quite suddenly. Life has a way of doing that to you. A dear friend of mine was scheduled to go in for surgery, when suddenly, the day before her procedure, her husband fell and broke his shoulder! So there they were, both needing care, and both unable to care for the other! Suddenly, that oh-so-convenient meal I had planned for my own relaxing cookout, became a needed and necessary component of caring for my friends! Could I pull a meal together quickly, and then transport it to my friends’ house, so that she and her family could eat? Smithfield® Marinated Fresh Pork made it more than possible! Since the meat is already marinated, it provides Real Flavor, Real Fast, which made my job in the kitchen a lot easier! It’s made from 100% fresh pork and has no artificial ingredients, so I felt good serving it to my family and my friends. This is the packaging on the Smithfield Roasted Garlic & Herb Marinated Pork Loin Filet that my husband grilled. It’s available at Food Lion. My husband and I make grilling a team effort. I man the kitchen, as it were, and he mans the grill. I’m the kind of cook who likes to brine or marinate my pork, but the product I had procured for this post, Smithfield’s Roasted Garlic & Herb Marinated Fresh Pork Loin Filet, came already marinated. So, not needing to find or prep any ingredients for the pork left me with a few extra minutes. While my husband prepped the grill, and grilled the pork loin, I had time to fancy up the rice, and the salad. Getting just the right char on the Smithfield Roasted Garlic & Herb Marinated Pork Loin Filet. To grill the pork, my husband simply grilled the already marinated pork over direct heat until there was a slight char on it. Once he had obtained the desired crust, he finished cooking the meat by moving it off to the side of the coals. (That’s called using indirect heat.) He turned it frequently so as not to burn the outside of the meat, and used a meat thermometer to check the internal temperature of the pork. He removed it from the grill when the pork had reached a temperature of around º145, and let it rest for 10 minutes before cutting it. For the rice, I used a basmati rice, that I first toasted in some butter and olive oil with cardamom seeds, until it smelled nutty and was beginning to brown. I added a minced garlic clove, toasted the rice with the garlic 1 minute more, and then poured in the water, and the zest of one lime. When the rice had cooked 15 minutes, I took it off the heat, let it rest with the lid on 10 more minutes. I then fluffed the rice with a fork, and poured in the juice of half a lime, and a huge handful of minced cilantro, which I mixed in with my fork. Basmati-Cardamom Rice, with Lime and Cilantro. Done. I know that pork and fruit have a love connection, so I wanted to incorporate some fruit into this meal. I had some mangos sitting around in the fruit basket, so I added them to the salad. To balance the sweetness of the mango, I chose a salty crumbled feta cheese. The honey toasted almond slices added a great crunchy texture and nutty flavor. My friend’s husband could NOT get enough of that salad! He raved over the yummy bits that fell to the bottom of the salad bowl, and the vinaigrette. 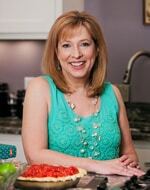 I’d really encourage you to try the recipe for salad that I’m sharing today. 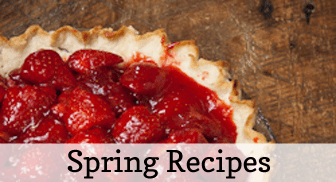 It’s simple, but show-stoppingly delicious! 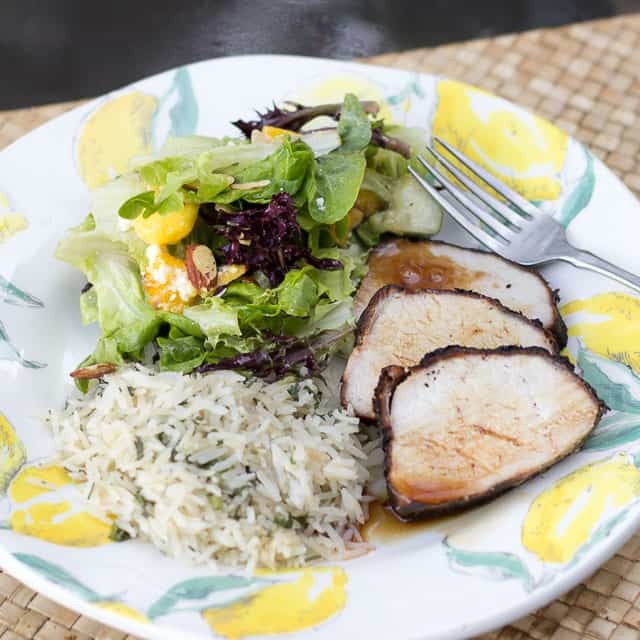 Between the Roasted Garlic and Herb Marinated flavors of the grilled pork loin filet, the lime and cilantro of the basmati rice, and the mango and almonds in the salad, the whole meal came together harmoniously, and deliciously! We finished the meal with an easy peach cobbler, topped with ice cream. What a way to kick off summer! My kids and my girlfriend’s kids have been friends since Diaper Days, (which feels like just yesterday! ), but now that all four of them have reached their College Days, their separate paths have taken them literally all over the US. It was so great to see them reunited, talking and laughing together over that meal. And it brought my husband and me so much joy to be able to help out some truly appreciative friends. Whether you spend your Memorial Day Weekend remembering those who gave all for our country, or re-uniting with family and friends, or both, service is a beautiful thing. And I found that Smithfield Marinated Fresh Pork made my job both easy, and delicious. 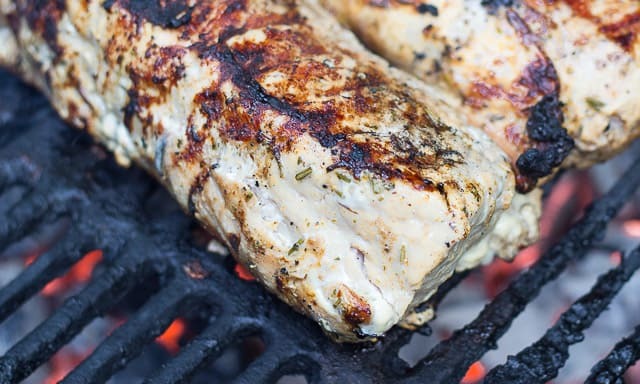 I’d encourage you to purchase Smithfield Marinated Fresh Pork at your local Food Lion for Memorial Day & summer get-togethers. 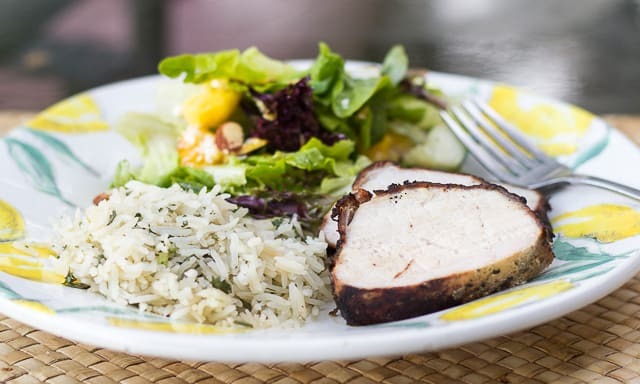 Smithfield Roasted Garlic & Herb Marinated Fresh Pork Loin Filet , Cilantro Lime Rice and Salad with Mango makes for an easy summer grilling menu. 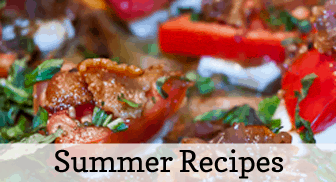 You can visit the Food Lion website for a $1.00 coupon on Marinated Fresh Pork. And just for fun, why don’t you also head to the Smithfield site, to enter the “What Can you do with 30?” sweepstakes. 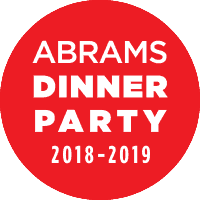 Submit a tip for getting dinner on the table in 30 minutes or less, for a chance to win a trip to Napa Valley. This salad is soooo yummy! A beautiful and delicious green salad, with chunks of mango, cucumber, honey-toasted almond slices and a sprinkling of feta, perfect for any grilled pork. 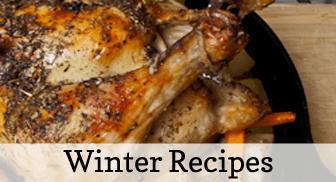 In a small bowl, whisk together the garlic, vinegar, mustard, honey, and olive oil. Season with salt to taste. 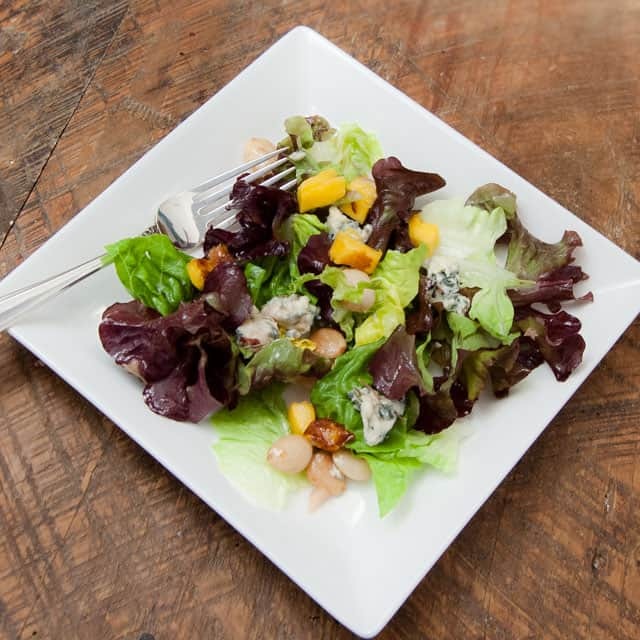 Gently mix together the mango, almonds, salad greens and feta cheese in a large mixing bowl. Toss with the vinaigrette. 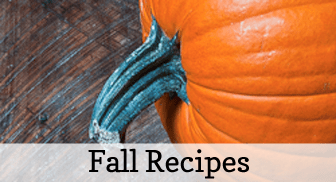 Perfect for Pinning on Pinterest! Grilled Marinated Pork Loin Filet with Mango Feta Salad is a quick, easy, delicious meal for any of your summer cookouts or grilling parties.